Do not upload my files to other sites. Feel free to modify my file; including releasing bug fixes or improving on the features my file add to the game, and upload it as a seperate file. And please do not forget to credit. 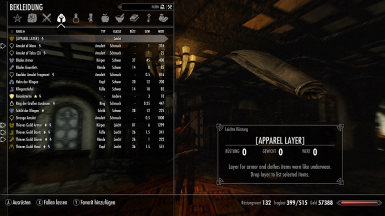 This mod adds an additional apparel layer for armor/clothing to your player inventory. "Right now I keep a Roughspun Tunic in my character’s inventory and pretend that they’re wearing it under their armor. With this mod they can wear (but not visibly) their tunic in the Apparel Layer and then when they unequip their armor they’re automatically wearing the tunic instead of standing there with their bits in the breeze." "Because it gives you the ability to double your armor slots"
"All magical robes or clothes that have an enchantment can be worn in the layer, and when normal armor is equipped, the enchantments, buffs, ect combine with anything else worn." The apparel layer is for pieces of armor and clothing, which are worn like underwear. 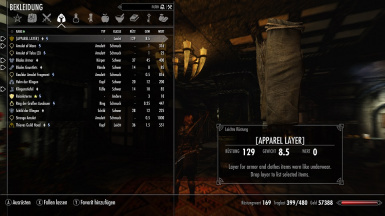 The apparel layer opens a container menu for selection of armor/clothing as layer items. 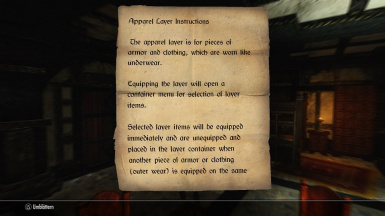 Selected layer items will be equipped immediately, and are unequipped and placed in the layer container when another piece of armor or clothing (outer wear) is equipped on the same body slot. When outer wear is taken off, the layer items will be removed from the layer container and reequipped automatically. 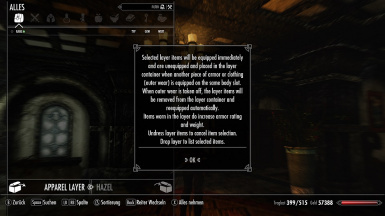 Worn layer items will be unequipped and placed in the layer container when another piece of armor or clothing (outer wear) is equipped on the same body slot. When outer wear is taken off, the layer item of the same body slot will be removed from the layer container and reequipped automatically. For deselecting a layer item take it from the layer container (1. and 2.) or simply undress the item. To list selected layer items activate the layer (2. without 1.). To stop the autochange process favorite the layer (1. ); unfavorite to start (e.g. favorite before for bathing in skyrim). Dropping the layer will reset the layer. 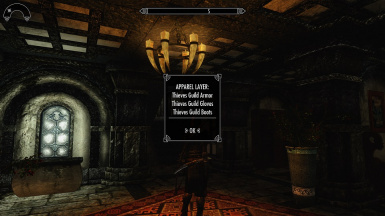 The apparel layer will mirror weight, armor rating and enchantments of all items placed in the layer. The layer can mirror around 50 different magical effects and will adopt 20 different magical effects at once maximum. The layer supports all body slots. Use NMM or any other mod manager or copy the unpacked files into your Skyrim Data folder. To uninstall use NMM or delete ApparelLayer.esp and ApparelLayer.bsa. Before upgrading remove all layer items from the layer, then uninstall old version and make clean save. No conflicts and no known incompatibilities. Please endorse if you like it!